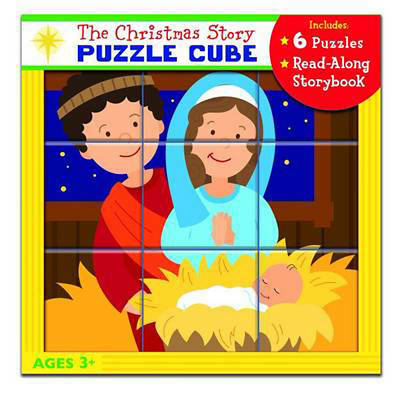 The Christmas Story Puzzle Cube depicts the story of Jesus' birth through simple, vibrant art with 6 creatively designed puzzles for the little ones in your life. The Christmas Story Puzzle Cube depicts the story of Jesus' birth through simple, vibrant art with 6 creatively designed puzzles for the little ones in your life. Each side of the puzzle cube shares an important sequence of the story: (1) The angel Gabriel telling Mary she will give birth to Jesus, (2) Mary and Joseph traveling to Bethlehem, (3) No room at the inn, (4) Mary giving birth to Jesus and laying Him in a manger, (5) the angels announcing the birth of Jesus to the shepherds, and (6) Magi following the star to bring gifts to Jesus. Also included is a 6" x 6" read-along book that you can share with your children as each side of the puzzle is put together. Very giftable and a great way to share the Christmas Story with your little ones!